The High Sierra Trail (HST) leads from Crescent Meadow up the canyon of the Middle Fork of the Kaweah River, crossing the Great Western Divide by the 10,700′ (3261 meters) pass known as Kaweah Gap. It descends into Big Arroyo, then climbs up to the Chagoopa Plateau, and drops down again into the Kern River Canyon. After running up the bottom of the Kern Canyon, it turns east, climbing parallel to Wallace Creek up to the junction with the John Muir Trail, 49 miles (79 km) from the starting point. You can then follow the John Muir Trail about 13 more miles (21 km) to the summit of Mount Whitney. Backpackers should encounter no difficulties, if reasonable distances are taken each day. We won’t be doing the whole HST on this trip. Instead of going north along the Kern River, we will be heading south. Our trip ends at the Lewis Camp Trailhead on the Sequoia National Forest. The actual Lewis Camp is long gone and the Kern Ranger Station cabin is there, which is ran by the Park Service. It was historically used as a camp for people traveling into the backcountry for fishing and summiting Mt. Whitney in the later 1800’s and early 1900’s. The trip is approximately 60 miles and will take about 8 days to complete. Want to know what is going on? Have a few questions? Want to know what I plan to bring? Click on the links below for more information! TRIP COMPLETE: August 10th at 830AM! It was hard to sleep that night. After a year of planning and some last-minute changes, the 60 mile trip along most of the High Sierra Trail was here. The alarm I set went off at 430 AM. I awoke, put on my hiking clothes and slipped out the front door around 440 AM. I was going to meet Seth at Denny’s for a big breakfast. I had my usual “make your own breakfast” while Seth enjoyed a bacon and avocado breakfast burrito. Once we finished we went back to my house where John, our driver, was ready to pick us up at 6 AM. We left home around 610 AM. Seth didn’t get much sleep the night before so he snoozed in the back of the truck while I chatted with John. We passed the park entrance kiosk and ended up waiting 30 minutes at a construction light on highway 198. The park is having a 3 mile portion of the road fixed at this time. We waited about 30 minutes and the line started moving. We arrived at Crescent Meadow around 830 AM. We loaded our gear, made some last-minute changes to our backpacks, said goodbye and thank you to John for driving us all the way up here. As he drove away we slung the backpacks on our back and started our adventure on the trail. Starting off at Crescent Meadow we walked along the southern edge and enjoyed the combination of a meadow mixed in with a sequoia grove. We walked about a mile and then the views started to change. We left the grove and were now looking out across a fork of the Kaweah River. Eagle View was rightly named when we approached it. Both Seth and I could not stop taking photos between the two of us. Once we left Eagle View each turn seemed to only get better than the first. Our first small creek crossing produced an array of color. Seth had recently bought a new point-and-shoot camera for the trip, so he tested out his macro settings on the flora. I took a few shots as well before we continued on down the trail. It wasn’t long after our creek crossing that we spotted a bear up ahead. It was a black bear, but his fur was bleached from the sun a bit. My guess is the bear was probably 175 lbs. We took pictures from a distance and proceeded toward the bear. We made noises and talked extra loud so the bear could hear us coming. He finally caught wind of us and casually made his way up the hill-side. I was tapping my trekking poles together to make sure he knew we were still around. Shortly after passing by where he ran up the hill people were resting under some shade. The rocky outcrop hillside made several seats for people to relax. The water and shade were a big plus. As we passed, we told them a bear was just 50 yards back down the trail and to keep an eye out. Their kids were excited and ran down the trail to go see the bear. Smiling we continued on as we had a way to go still. It was about mid to late morning when the sun was getting high enough to pierce through the haze/smog. This made for better photos and bluer skies. We came out to another point, which ended up being a perfect first group shot along the trail. We used Seth’s camera for the shot as his tripod, called a Joby, worked perfectly. We ate lunch about 10 minutes later at a creek crossing. It was nice to take off our bags for a bit while we ate. A packer and small pack train came by. The gentlemen said hello and commented on how beautiful the day was on the trail. We couldn’t agree more as we munched down some trail mix. About a mile before reaching Bearpaw Meadow, the trail crosses Buck Canyon. A small bridge sits there for users to cross. There was an older couple down there who were enjoying a break by the creek. We chatted a bit and the man mentioned he had done this trail 3 times already, but was taking his lady friend for the first time. He talked about how last year the creek was almost touching the bridge. After chatting a little longer we found out they both were going to stop at Moraine Lake. We told them we would likely see them there since we were stopping there too. Proceeding across the bridge, we made our first and last uphill mile trek to the camp. The trek was a forested area, which limited our grand views from earlier. However, near the top of the trail, there was this bright orange and yellow color. We soon discovered it was a large group of conks at the base of a tree. About 0.2 miles later we arrived at Bearpaw Meadow. We setup camp right away. Out came the bivy sacks, sleeping bags, and sleeping pads. It didn’t take long and we took out our bear canisters to get ready for dinner later on. While we were enjoying having our packs off and at camp, a doe walked through. She apparently was used to people and didn’t mind us taking photos. Following her photo shoot, she returned again after our dinner. We snapped a couple more before burning our trash. The sun was starting to set and we decided to get check out the High Sierra Camp. Even though we didn’t want to really hike uphill to check out the camp, we were glad we did. The camp has a great view of the high country to the east. The sun turned the rocky mountains into various pastel colors of red, yellow, and orange. I think we took a bunch of photos while we were there. We talked with fellow backpackers and quickly with those staying at the camp. Apparently you can rent them from the Park for an extended period of time. I made sure to grab some shots of the cabin to show Diana. Once the sun had set we returned back to camp for the evening and said hi to a buck passing by. Like clock work, my internal alarm woke me up at 545AM. It was time to break down camp and hit the trail. We had about 10 miles to hike and most of it was going to be uphill. Breakfast was going to be instant oatmeal each day of the trip for both of us. We simply heated up the water and enjoyed breakfast. There wasn’t a routine yet, so we killed time watching the water heat up. Around 7AM we were on the trail and making our way to Nine Lake Basin. On our way out of Bearpaw Meadow we used the outhouse once more. After using it, I couldn’t wait to dig my own hole honestly. Anyway, we checked out the High Sierra Camp on our way down the trail too. The ranger’s cabin was more uphill and near the “A framed” home. We were back to seeing the high country once more as we made our way along with a doe and her fawn scampering along the trail shortly after passing the cabins. We encountered another black bear within 30 minutes of walking. It apparently was sleeping on the trail. Seth didn’t see him because a large fur tree was blocking his view. I saw a black fuzzy animal sit up suddenly. “Don’t move, there is a bear ahead of you behind the tree,” I told Seth. In order to let the bear know where Seth was, he purposely raised his voice saying, “Oh there is a bear up ahead?” The bear heard this and took off running downhill crashing through brush. We didn’t see him after that, but found where he bedded down for the night. We were unable to get our cameras out for a photo of the bear, but did grab some individual shots shortly after. The trail went downhill for about 1.5 miles. There is a bridge crossing over a steep and small canyon. We took a few photos of the old bridge that had fallen some time ago. It was neat to be there and spend a few minutes taking the photos. Now we were going to be heading uphill into Valhalla Canyon containing Hamilton Lakes, Precipice Lake, and the Kaweah Gap. Once across the bridge, we began our hike up into Valhalla. Again every turn and stopping point along the trail provided gorgeous panoramic views. We snapped photos when we could of the scenery as well as some of the vegetation. We eventually came to a falls where we enjoyed a small break and a snack. I put on some mole skin for a hot spot I had too. Once finished, we continued to hike uphill. It wasn’t long till we came across one of Hamilton Lakes. There was no direct route or trail down to the lake. We didn’t want to stop there, so we snapped a few shots from the High Sierra Trail. We figured there would be some sort of sign letting us know where the “real” Hamilton Lake was. I recalled seeing a photo and the lake looked a lot bigger to me. As we pressed onward we soon arrived at the “real” lake. Sure enough there was a sign stating where you couldn’t camp and where a pit toilet was located. The trail takes you to the outlet of the lake and this is where we snapped a good amount of photos and took another break. A gentlemen approached Seth about his water filter. Apparently his filter was causing problems, so he was just going to drink right from the lake. He was interested in our water filters so Seth told him how it worked. He seemed impressed by it and may buy one when he returns home. We grabbed a snack, drank down a good amount of water, and relaxed a little more. 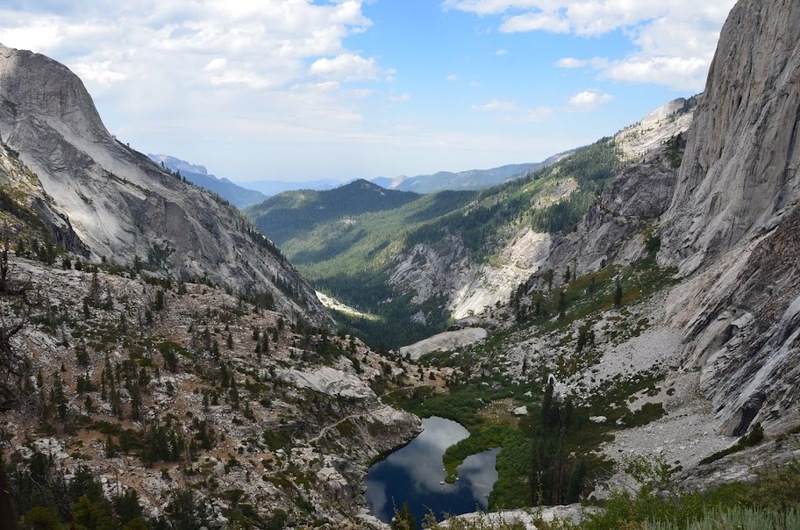 Feeling our energy levels returning, we continued our trek to Precipice Lake and the Kaweah Gap. It was a long uphill climb, but we were once again rewarded with spectacular views of Valhalla. Some of the rocks along the way changed in color providing a great contrast with the vegetation. We stopped to take another single shot of ourselves too. About 35% of the way to Kaweah Gap, there was an old bridge. Abutments are still there where the cables were once attached. I am not sure when, but the Park decided to blast through the rock creating a tunnel and new trail. No longer did anyone need to cross a bridge. It wasn’t a long tunnel, but it was pretty cool to actually be going through a part of the mountain. Once we passed through the tunnel, we ended up getting rained on for a few minutes. I put my camera away during this time too. The rain was actually refreshing and cooled us down a bit. None of us were worried about our gear getting wet either. The rain stopped a few minutes before we arrived at Precipice Lake. I took my camera back out and snapped a few more photos. The rain returned for a few more minutes too. Above Precipice Lake, the trail flattens out a bit and our paced quickened. Small puddles or ponds exist on this stretch. Some had dried up already too. We ended up having a snack about 500 feet from the Kaweah Gap. It was a good thing we did too, because we both needed an energy boost. The wind was picking up making the temperatures drop outside. Thankfully we were dry by this time. We rolled down sleeves and zipped our pant legs back on to stay warmer. The Kaweah Gap provides a wondering 360 degree view. The gap separates the Kaweah River from the Kern River. We were pumped up that our uphill climbing was done for the day and the grand view was our reward. We definitely had to snap some photos while up there. I turned on the video mode of my camera and did a 360 view of the area. Now it was only a mile to our campsite. We stayed at Nine Lake Basin and were the only ones as far as we can tell. The wind was constantly blowing by while setting up camp. I changed out of my hiking shirt and put my down jacket and hoodie on. The lake was beautiful with the surrounding peaks. We could see the Black Kaweah peak tot he east and the Big Arroyo drainage to the south. Camp was setup rather quickly and I enjoyed walking around barefoot for a bit. The ground was soft and dry, which was a perfect combination after being in boots most of the day. We both went down to take some photos of the lake and the surrounding landscape. The clouds were getting darker, so we decided to eat an early dinner. Seth found a nice spot out of the wind to get our stoves going. A marmot came out barking at us to the north. Our guess was that we used his rock as a restroom and he didn’t appreciate it. He didn’t come any closer to us, but decided to watch us for a scrutinizing eye. The marmot watched us for sometime until thunder sounded in the heavens. He quickly ducked under his rock for cover. Finished with dinner, we took the marmots lead and cleaned up camp. We put our gear in our bags, flipped over our boots, and jumped in our bivy sacks. Within about 15 minutes hail started falling from the sky and the outside temperature dropped by about 15 degrees. We tried to take photos when we could. The pelting sound combined with the loud thunder and bright flashes of lightning made for an exciting time in the bivy. Everything stopped about 15 or so minutes later. We poked out of the bivy sack only to quickly duck under them again as another round of hail, rain, thunder, and lightning engulfed our campsite. This time I tried grabbing a video of the hail coming down. After about an hour inside the bivy, the storm passed to the north. We left our bivy sacks to check out what was wet. The sunset to the south was beautiful and was a nice way of saying the storms were done for the day. We went to bed early that night. I woke up in the middle of the night to a nearly full moon outside. I tried taking some photos, but I don’t think they turned out. The rocks were glowing in the moonlight and the reflection off the lake topped it off. I smiled and thought I will definitely have to take my family here in the future. With the thought of my family adventuring along the High Sierra Trail, I went back to sleep. At 545 AM I signaled it was time to get up by deflating my mattress inside the bivy. I heard Seth shuffle around and do the same shortly after I had started. We prepared breakfast and broke down camp. Our marmot friend came back out to survey his territory. Apparently he wasn’t too upset this time or maybe he was braver as he moved closer to our camp. He enjoyed soaking up the sun along the way and I snapped a few photos. We ended up getting water near the outlet of the lake. The trail was downhill at the start. We were in the shadow of the Kaweah’s while we trekked along the Big Arroyo. Wonderful views of this glacier carved valley was appearing as the sun rose to expose them from the shadows. At one point some of the vegetation was steaming as the sun’s rays were beating down the frost that had set in over night. We met up with a Park Ranger and her volunteer. She double checked our permit and departed with a smile. It wasn’t too long after seeing the ranger that we were at the Big Arroyo trail junction. Our trail now went uphill for about 2 miles. We walked up about 1oo yards and took our snack break. My ankle was really bothering me for some reason at this point. I took my boot of to check and the skin was read. Any pressure would send pain up my leg. Not entirely sure what it was, we rested a bit and headed uphill. We continued to take more photos as we climbed in elevation. After an hour or so we made it to the flat and downhill section called the Chagoopa Plateau. We were on the very northwestern portion of the plateau. There was a lot of fallen lodgepoles here. Mt. Kaweah greeted us as we continued on through a series of meadows. Eventually we had to stop again because of my ankle. I taped my ankle to immobilize it, which did great. I was able to walk on it again without pain. We were not aware of the junction coming up to Moraine Lake as we took a few more photos of a meadow and Mt. Kaweah in the background. We thought of Brian and how he would have loved to see these peaks. We grabbed a couple of solo shots and walked another 100 yards to the junction. This section of the trail is very sandy and warm. The parks metal sign as well as stacked rocks made us aware of the junction point. With only 2.2 miles to go, we were going at a good pace towards Moraine Lake. We talked often and shared stories of our lives along the way. There happened to be a nice detour about a mile down the trail to the west. We walked on over there to a grand view of the Big Arroyo and several tributary canyons. The peaks of Mineral King were to the west and we could look back up into Nine Lake Basin area. We grabbed more photos of course! It was a vertical drop below, so we made sure to be extra careful not to slip. I experience a little vertigo when I went out on the ledge, so the photo of me didn’t come out so relaxed :). We made our way back to the trail and continued heading downhill. When we arrived at Moraine Lake, there was a group of four there who stopped for lunch. We recognized them from Bearpaw Meadow and asked if they were going to stay here for the night. They shook their heads no and said they were only stopping for lunch. That was not a problem as we would have the whole lake to ourselves. With our gear off our backs, we went straight out to the lake to scope out the view. We then looked around for bear boxes after sometime viewing the lake. We found the camps bear box and instructions on the side. We setup our camp near the communal fire ring. Since it was still early in the afternoon, we let a lot of our gear sit in the sun. It didn’t take long to dry, but the playing cards didn’t dry that day. The sun was beginning to set and we were still the only ones at the lake. We thought we may be the only ones for the night. However, a family of four arrived. It looked like a father and his son and two daughters. We told them it was a communal fire ring and not to be shy about getting close to the fire that night. We also warned them about all the leaning trees wanting to come down. They did pick a safe spot to camp after looking up several times, which is pretty much what we did when we were looking for a place to set up. That night we shared stories around the fire. They were going to summit Mt. Whitney on Friday, hitchhike back to their vehicle in Crescent Meadow, and get to a concert in San Francisco by Saturday evening. It could be done, but would make for a long day. We sure hoped they made it to the concert. The girls seem to be looking forward to it. They also mentioned they were doing about 15 mile days. They appeared to all be in good shape, but you could tell the bags off their backs was welcomed. We all left the fire ring around 930ish to brush teeth and head to bed. Seth and I went out to the lake for some night photography. The lake at night was very calm. The water was like a mirror so the mountains and stars were seen on the water. The Milky Way was visible that night as the moon had not risen yet. We must have taken a dozen or so photos. We tried different settings on our cameras to capture those moments. Following those shots, we went to bed. Monday was our first day off from hiking on the trip. Even though we could sleep in, my internal alarm said otherwise. I was up around 6 this time and enjoyed the stillness the mornings bring. It was nice not to have to tear down camp or cook food right away. I checked out the camp and went to the lake to watch the sunrise. Seth wanted to get up early for the sunrise shots, so I made sure to quietly stir him. I didn’t want to wake our neighbors. Following the photos of the lake, we started up breakfast. Our fellow travelers were up and getting ready to start their day. Around 730 AM we said goodbye to them and once again we had the lake to ourselves. It would have been a perfect time for a swim as the water was warmer than the outside air. However, the wind was stirring up again and we decided to wait. Seth took some photos of the flowers in the lake while we were there. By the early afternoon a couple of people were at the lake. Another two wondered in after a bit. In the late afternoon, a group of 8 to 10 people showed up. They were a talkative bunch of guys of all ages. We ended up talking to them for a bit. One gentleman was a corrosion engineer. He had traveled all over the world and shared his stories with us. I told him where I worked and the differences between agencies. He did tell us their group was going to Mt. Whitney. Their trek started in Mineral King and went north over Timber Gap then east over Black Rock Pass. They went north to the Big Arroyo junction and ended up at Moraine Lake. He said it was a brutal uphill climb to Black Rock Pass. Looking at the topo maps when he was explaining his route, it was a steep climb. We met others in their group and shared stories of work, our lives, and our camping gear before bed. I woke up around 530 AM and did the usual mattress deflating right then. Seth woke to the sound and did the same thing. Another round of oatmeal and after packing up our gear we waved goodbye to our fellow travelers around 630 AM. We needed to head down to the Kern River Canyon and go south towards Rattlesnake Creek. The morning air was nice and cool. My ankle was a lot better, so we made good time. A graveyard of standing and fallen trees was common on this stretch of the trail. We saw Sky Parlor Meadow and thought we may catch some wildlife out there. Unfortunately that was not the case, but we did stumble upon an old cabin on the southern side of the meadow. After hiking for 1.5 miles from Moraine Lake, you arrive at a junction. We took a right to continue on to the Kern River. It was going to be a steep downhill trek as we were going to descend 2,000 feet in the next 2 to 2.5 miles! There must have been a fire in this section at one point, which made for some pretty photos as the ferns were clearly loving the open canopy. Hiking further we started to see parts of the Kern Canyon and eventually snagged a couple of group photos on our way down. We crossed the same creek a couple of times too. There were two guys coming up the trail. They were not exhausted, but I am sure they were happy to be hiking uphill in the cool of the morning. They warned us the weather was going to be warm in the canyon. It wasn’t long before we reached our next trail junction at the Kern River. We turned south and said goodbye to the High Sierra Trail. Soon we were greeted with a gate along the trail. It was to help control “escaped” horses/mules from pack trains. We opened it up and were about to close it when a packer and his clients were coming through. We stepped out of the way, said good morning, and shut the gate behind them. We continued our pace of 2 to 2.5 mph. Another doe was seen, so we grabbed a shot of her. She definitely wasn’t used to people like the ones at Bearpaw Meadow. However, she did pose for a quick photo in the distance as we passed by. We also grabbed photos of the Kern River along this stretch. The trail provided several opportunities to see and get in the Kern River if we chose to do so. Rattlesnake Creek was our destination that day. We arrived and decided to press on. Mosquitoes were quite active there and there was no campground. We could have set up a camp, but clearing out the dry vegetation for a fire seemed like too much work. It was early in the morning still and being all downhill, we continued on to Funston Meadow. Several more shots were taken of the Kern River as well as the trail. It changed often from a forest floor where you couldn’t see anything but the trail to a sandy open clearing. The river would constantly hum in the background when you were away from it. We never had to worry about a water source :). We arrived at Funston Meadow around noon. A sign pointed across the meadow stating there were campsites. The trail vanished in the meadow, so we spread out to see if we could find anything. Eventually we did, but the camp had not been used for some time. There are two bear boxes and one fire ring. The vegetation would take a while to clear so we could have a fire. Further exploration to the east found a nice beach area to rest under and some shade too. We decided to press on to the Kern Ranger Station after a couple of hours break. The temperatures were warm and the Kern River looked very welcoming. I ended up being able to try out the snake and sting kit at this point. Apparently the bee hive I thought was abandoned was not, so when we were heading out to the beach area with our gear one got me behind the right leg. It burned a bit and was getting worse as I continued to walk. Once I sat down, I took out my first aid kit and gave it a try. It worked amazingly! In about 60 to 90 seconds the stinger popped out as well as all the stinging venom/liquid that follows a bee sting. The great thing is the kit is only $12 and everyone should have one at home. You can reuse it over and over again. No need to “suffer” a bee sting for a long time with this baby! Anyway, I was happy it worked and that it wasn’t a snake bite. While I rested a bit, Seth went to explore. He stumbled upon a rattlesnake, but thankfully the snake appeared to be resting. Seth just went an alternate route to explore after coming back for his camera and sharing his story. He took several shots of butterflies and the flora in the meadow before we left. I took a photo of the fish swimming near our resting spot. Around 230 PM we loaded up our bags, filled our water bottles, and started making our way back to the trail. We took our time in case another bee nest or snake was round. Thankfully there weren’t any, so once on the trail we sped up. The Kern Ranger Station was about 2.5 miles away. Our way down the Kern Canyon provided us with more photo opportunities. A bald eagle flew by, which we were able to get only a zoomed in photo. Several lizards were sunning on rocks too. Seth and I decided to lift a boulder over our heads for fun :). The Kern River Canyon was beginning to narrow up so the water was becoming faster. The trail was still warm from the afternoon sun, but the sun wasn’t as hot anymore. The Kern Ranger Station is a cool looking cabin. They have a solar panel hooked up too. No ranger was in site and we walked around looking for a place to camp. We found a dispersed camp already setup. It appeared to be the Park’s trail crew. However, no crew members were there. We decided to cross Coyote Pass Creek and head towards the Golden Trout Wilderness. Once across the river, it took only seconds and we were at the boundary. We stopped to take photos as it is a tradition of mine. On another tree a sign read “Hocket Trail Built in 1858.” It was neat to be walking on a historical trail for sure. Over 150 years old! Anyway we made our way down to a flat near the Kern River. Apparently it was a common place to camp upon our arrival as chairs and table like structures were setup. A fire ring was there too. We setup our bivys as well as our shower for the evening. We had hiked 14 miles that day and it was good to be done. I took another video of our camp before going to bed. It was warm in the canyon for sure. We awoke around 530 AM this time. Our destination was going to be the Little Kern Lake. Our plan B was to go further south to a spring just north of Willow Meadow. We would go with Plan B if the lake didn’t work out for us. After our usual morning routine we left a little after 7 AM. The trail was definitely different since we left the Park. Maintenance was very little. There were several trees down along the trail with reroutes. Some of the reroutes were well established suggesting years of no maintenance. It was a bummer to zigzag around at times, but for the most part it was alright. I was always told people enjoyed fishing this stretch of the Kern River. After coming across some of the views, I could see why. Prior to Kern Lake the river was like glass. I could imagine fishermen in the waders fly fishing out there. In fact another commonly used dispersed camp was setup near the river. We arrived at Kern Lake and, to our disappointment, it was a swamp. Mosquitoes covered the surface of the water, so we kept moving uphill to a small pass. Once at the pass, the trail went back downhill to Little Kern Lake. The trail was sandy, but easy going. We were not able to get any good photos of the lake though. A lot of trees were around. However, I was able to get a photo with a fisherman out in the lake. Deciding to go with Plan B, we continued on down the trail. We snapped a photo of a flower along the way and went through another “gate.” It was an uphill climb to the top of another small pass. This area is known as the “Devil’s Staircase” on USGS topographic maps. It lives up to the name too…at least if you are coming uphill. We went down the staircase and it wasn’t bad. The face-flies were really annoying. At the bottom of the staircase the trail goes through a flat sandy stretch called grasshopper flat. It was warm and seemed to take a long time to get through. I believe the sand had a lot to do with slowing down time. It was warming up and we couldn’t wait to get to the spring by this point. We crossed through another gate and came upon Leggett Creek. A recent landslide happened there in 2008. I visited the area in 2009 with Diana (read the story). The vegetation had finally grown back as the creek was becoming established in its new location. I shared the memories and history of the area with Seth as we passed through. Now began our trek uphill. We would no longer be walking by the Kern River. As we made our way up the steep section, it seemed every step was getting hotter and hotter. Sweat was surfacing on my palms, which rarely happens. It was just so hot, but thankfully Angora Creek was our savior. We dunked our shirts and hats into the cold water. It was a bit shocking to our bodies, but felt great. We thanked God for the wind that made it feel like we had air conditioning as we continued up the trail to a final vista point. There we took solo photos and waved goodbye to the Kern Canyon. Shortly after taking our photos we met up with three people on horseback. I knew the gentlemen in the middle. We chatted a little bit and waved goodbye. Now that the trail was relatively flat, we made better time. It was still sandy though, but not nearly as bad as the section through Grasshopper Flat. Soon we were at the spring by noon. We enjoyed lunch, took photos, and enjoyed resting for several hours. Around 5 PM the three guys on horseback returned. I asked my friend if they wouldn’t mind having us along for company at their camp in Trout Meadow. With a big smile he said, “heck yeah and we will feed you too. We have plenty of food!” That was music to both Seth and my ears. I told them we would pack up some small stuff and see them there soon. We walked for another hour and arrived at Trout Meadow. Introductions were made, spare chairs were given, and we felt like we had moved up to the Hilton of backpacking. Dinner was spaghetti with Italian sausage, garlic bread, and fresh salad. Seth and I both ate two of everything. I think it was entertaining to everyone. Not that we were like pigs, but they understood how hungry for real food we were. Plus there was less to clean up with both of us around. The remaining part of the evening was joke telling, laughing, story telling, teasing one another, and really just living up the good life. We were so far ahead of schedule, that the next day we just rested all day and tried to stay cool. Resting at Trout Meadow all day was the agenda. My friend and his group left the place so we had it all to ourselves. It was quite, relaxing and warm. We decided we had better wake up around 4AM and start hiking an hour later to avoid the heat. The weather service on my handheld radio said it was supposed to be 104 degrees in the valley. That only meant a hot hike out if it wasn’t early. “Beep… beep…. beep,” went my watch alarm. It was 4 AM and with our headlamps on, we made breakfast. We were on the trail around 515 AM and it was perfect outside. We could still see silhouettes of trees, but needed the headlamp for trails. The temps were cool, so we chatted all the way to the Little Kern Bridge. After taking a break and sharing some stories of my last trip through the area, we started to ascend up to Lewis Camp Trailhead. It was our final destination for the day too. I had remembered it being long, hot, and miserable. Thankfully it wasn’t as hot this time around, so it seemed to go much faster. The first mile was probably the most difficult. The trail just keeps going up and up and up. We met some hikers coming into the wilderness. We said hi and after they passed chuckled a little bit. You can tell it was their first day. Bright eyed and bushy-tailed as the saying goes. Once at the top of the ridgeline and half way to our destination, two large packs were on the grand. These were packs that went on a mule. A leather strap was further up the trail. We wondered what had spooked the mule carrying the load. We ate our snack at this point too and contemplated it some more. Back on our feet we marched a long. The temperature was definitely increasing, but the early morning shade from the trees and breeze was nice. We met up with some guys on horseback. I asked if they had lost any packs and they said no. Their dog was afraid of us for some reason though. He stayed back while they rode on past us and would not budge. They yelled, cursed at the dog, and they started talking about us as though we were doing something wrong. We decided to step further away from the trial and the dog finally took off to catch up. We came up to the trail sign for the Golden Trout Wilderness. I told Seth it was just 10 more minutes from this sign and it was all over. We took a fun pose then a more serious shot of each of us. Once that was done within 10 minutes we were at the top. The trip was now over and all we had to do was wait for our ride to show up to take us home. We ended up finishing the day at The Hamburger Stand in Springville. The double cheeseburger deluxe, large curly fry, and a large banana nut milkshake was perfect. Seth got his cheeseburger deluxe with bacon and mushrooms large curly fry, and a medium milkshake. And that was our 60 mile trip for 2012! you are gifted in pulling trip plans together. well done! I will definitely think about it. I just have to decide if I would be able to do a week plus backpacking trip! Yeah I think I will finally get the photos in there around Christmas. Too much to do till then haha. I plan on making a Shutterfly Book of our adventure. When I get that made, I will send you a link too :). Finally added the photos after 4 years…at least photos mixed in with the story.